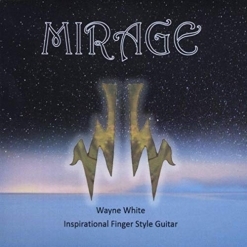 Mirage is the second finger-style acoustic guitar album from award-winning Idaho guitarist Wayne White. I don’t have liner notes to refer to, but I assume that ten of the eleven tracks are original. The eleventh, “While My Guitar Gently Weeps,” is, of course, a Beatles classic. Most of the tracks are solo acoustic guitar, but two are duets for guitar and violin and one has harmonica with the guitar. All of the music is very accessible and easy to listen to, with some pieces that are quiet and reflective while others are more upbeat and fun. Mirage is beautifully recorded as well as expressively played and has the resonance and intimacy of the best solo acoustic guitar albums. Mirage begins with “Justified,” a piece that includes percussive rhythmic effects accomplished by playing on the body of the guitar - a great start! “One & Done” is a soulful guitar and harmonica duet that transports the listener to the open plains and gives you a wonderful feeling that all is right with the world - or at least that little corner of it! The melancholy “Broken Again” suggests images of someone playing the guitar in the dark and quiet of an empty house to express his (or her) sorrows. I find this one especially moving! “Rendezvous” is much lighter and more optimistic with an easy-going tempo and gently percussive hand-claps (or perhaps taps on the body of the guitar). “The Second Solution” is a poignant duet for guitar and violin (both bowed and pizzicato) and is a perfect illustration of why White calls himself “the master of hopeful melancholy.” “Graham Crackers and Milk” has a spirited approach similar to Simon and Garfunkle’s classic "The 59th Street Bridge Song (Feelin' Groovy).” George Harrison’s “While My Guitar Gently Weeps” has been recorded by a wide variety of artists, but there is something especially pure and honest when it is a guitar solo (like White’s arrangement). The title track is jazzier with a brisk tempo and a sunny demeanor. The gently nostalgic “Those Were The Days” is sweetly dreamy - perhaps another example of “hopeful melancholy.” I really like this one, too! The ballad-style “Know and Tell” seems to be telling a light-hearted story. “The Innocent Man” graces us with another deeply emotional duet for guitar and violin, expressing feelings of loss or even tragedy. 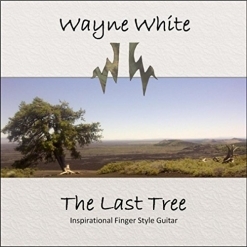 Slow, sad and from the heart it’s a poignant close to an exceptional guitar album. Mirage is available from Amazon, iTunes and CD Baby as well as many streaming sites.